I missed blogging all this week because I was in the mud, wrestling with chan_skype, trying to get it to work in an Ubuntu VM. It's a real pain to get compiled and installed. Hopefully I'll have it up and working shortly. Shouts to the Sploitcast crew who let me sit in on a conference call. The call actually went for 4+ hours today and I think that wlc already has it edited back to about an hour. Whether my comments survived or not remains to be seen. 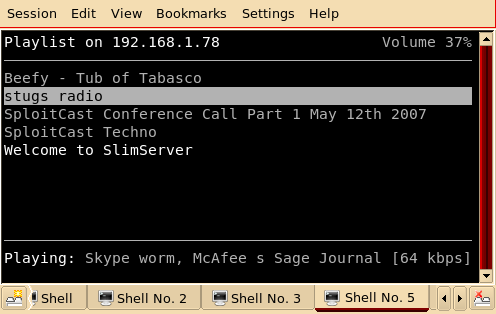 It was fun experimenting with TalkShoe and Skype though. To tell the truth, I mostly lurked in the call. I was actually working on getting a NSLU2 reflashed. Below is a screenshot of the final product (NSLU2 runing MPD which is listening to various streams, including the SlimServer on my desktop).